Wait, So Will the Zune Make Common My Homie? It's not immediately clear what's going on in this spot for Microsoft's Zune, featuring Common and Afrika Bambaataa. In it, a girl puts Common's Universal Mind Control on the spin. She gives props for it, then Common and Afrika Bambaataa leap out of a cloud of images and start sparring over it. At first the whole thing rang like a poorer rendition of HP's "Hands" campaign, which does a good job of connecting the essence of a celebrity to the machine he's using. To promote the fusion of Comcast DVR with TiVo, Biscuit Filmworks USA and Goodby, Silverstein & Partners give us "Separated at Birth." It's a love story about a pair of TVs that part at the assembly line and serve two people in two different ways. In the end, the owners -- which start out as kids -- grow up and get together. Just like their favourite TV services. Almost too cute to stand. The split ad format keeps eyes bouncing back and forth, and a simple narrative prevents captive audiences from snapping out of it. We'll even be willing to ignore the fact that TiVo hasn't been around long enough to have served any twenty-something from her budding days as a grade school control freak. 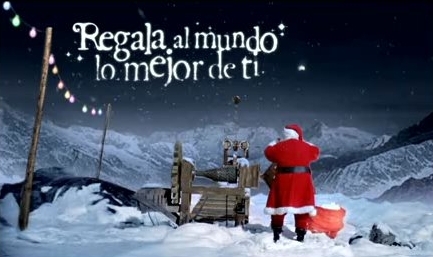 That Coke Christmas commercial which was teased last week is out in full form. And, like the teaser, it captures all the magic and mystery of Christmas. Like we said before, not much else to say. Well, just that there's a nice cover of Elvis' Can't Help Falling In Love With You in the commercial. Watch and enjoy. OK here's another one of those "wear your seatbelt, idiot" commercials. This one, from AMV BBDO, takes a decidedly more "Road Safety 101" approach than most which pray on emotion such as this outstanding commercial from Ireland, one of the most powerful commercials of any kind we've ever seen . Why Would You Want a Body Spray that Smelled Like Your Deodorant? That's the question my friend Elinora asks herself every time she sees this suspiciously meditative ad for Dove Go Fresh Body Mist, "in the same cool scents as Go Fresh deodorants." Variants include women in flowing dresses or underpants, writhing in harmony as little Dove logos waft around their armpits, tummies and legs. Then one day, waiting impatiently for Life: Black Friday to return on Hulu, it hit her like a ton of bird-shaped bricks: "IT'S COOCH SPRAY!" she shrieked. I don't know if she primed me for it or what, but the ad does have that timeless Massengill flair. "Mom, do you ever feel, you know ... not so fresh?" Tagline on the Dove spot vibes almost like a tip-off: "Go beyond fresh." Mexico is gearing up for Christmas. A teaser from Coke featuring Santa is out and beautifully captures all the glory of the holiday season. Not much else to say. Sometimes the clothes are simply more important than the people wearing them. Most fashion brands know this but wouldn't exactly shout it for fear of harming sales but Sela, in a way, doesn't see that as a problem. In a playful video which features a man and a woman doing a rooftop flirting dance while dressing themselves ultimately find themselves at an impasse. And because, well, the clothes are far more important than the people wearing them, these clothes take matters into their own hands. The clothes get what the clothes want.